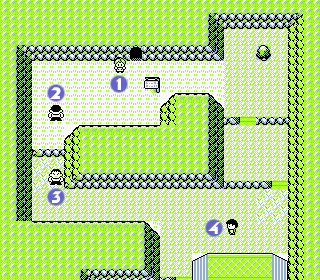 Lavender Town is renowned as the last resting place for many dear, departed Pokémon. Every day, devoted trainers attend memorial services in Pokémon Tower, but lately, the tower has gained a reputation for being haunted by malevolent spirits! You'd better conquer your fears of ghosts if you want to get to the bottom of this ominous mystery. You're not out of the woods yet... Four more challengers await in the southernmost chunk of Route #10. Fortunately, unless if you want to get that little exp, you can avoid them all by skipping off to the right. Don't forget to check the lone tree to the right, or you'll miss a Max Ether. Finally, a chance to heal and relax for a bit! The Pokémon Necropolis of Lavender is a tiny town, but there are a couple of interesting things afoot. The Mart, in the bottom right corner of town, sells a ton of great new stuff, including Revive, which cures Fainted Pokémon to half their health, and the extra powerful Great Balls (its catch rate is x1.5 this time). If you'd like to change one of your Pokémon's nickname, then visit this fellow in his registry office (of the two touching homes in town, his is on the right). Rating nicknames seems like a very odd occupation, but there's no charge for this service, so it's obviously a labor of love. Keep in mind that you can only rename your Pokémon if you're the original owner of it. 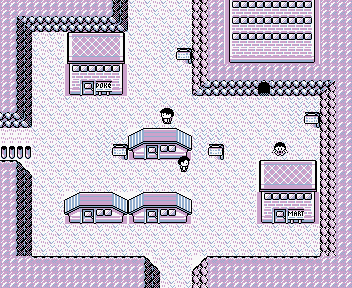 Kind Mr. Fuji is the head of the Volunteer Pokémon Center in Lavender Town, but the elderly gentleman has gone missing from his home in the center of town. It may be that his sudden disappearance has something to do with the strange disturbances in Pokémon Tower, but there's no telling yet what the connection is. It's best just to push on, but keep your eyes open for clues. The source of all the problems seems to be the Pokémon Tower in the upper right corner of town, where you'll find your rival waiting to ambush you (if you want to skip it for now, just stay out of the Tower although the rival battle is relatively easy). If you go even further, you'll start running into Ghosts and possessed Pokémon Psychics... Without a Silph Scope, you'll have to run from the random encounters, but you can fight the Psychics' pets: ghosts are incredibly difficult to defeat, but Psychic Pokémon like Drowzee can shred them with a single blast of Confusion or Psybeam. No point in going any further: you'll be turned back at the 6th Floor if you don't have that Scope! Rumor has it you can obtain a Silph Scope in Celadon City, so it's time to hit the road again, this time, head west. This page was last edited on 29 September 2015, at 18:54. This page has been accessed 808,986 times.